Do Face Tightening Exercises Work? 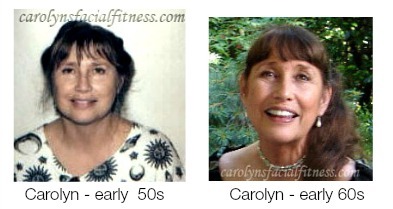 This woman (Carolyn owner and creator of Carolyn's Facial Fitness) looks younger in her 60s than she did in her early 50s! It all started with my mom. She sparked my interest in facial exercises when she bought me an micro-electronic facial exercise machine that stimulated underlying facial muscles to help firm and lift the face. I didn't use the device long enough to really see results (of course I was under 30 at that time and probably didn’t really need it) but I do remember how it stung and hurt if I didn't constantly apply a special gel to keep my skin moist. It’s no surprise this face exercise machine soon found a home in the back of my closet! But, I was intrigued by the idea of exercising the face to lift and firm it. So sometime in my early 40s I started looking into the benefits of face tightening exercises…..wondering if they really worked. Before and After. Eight Year Difference Between The Two Pictures. Note: These are not "before and after" pictures because I've been performing various facial exercises (off and on) since around the late 1990s. But I think they show that face exercising can help slow "age related" changes of the face and neck. Which I feel is a good sign! 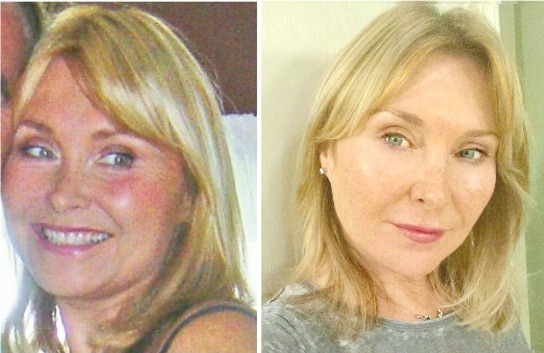 Because age related facial changes happen very quickly once we're over 50...especially, droopy eyelids, flatten cheek bones, hollows under the eyes, disappearing jowl line, double chin and underslung jaw. Hardest area to firm? Eyes, jowls, and neck. While they are the hardest to fix once things started to head south, it's not impossible to improve those areas. 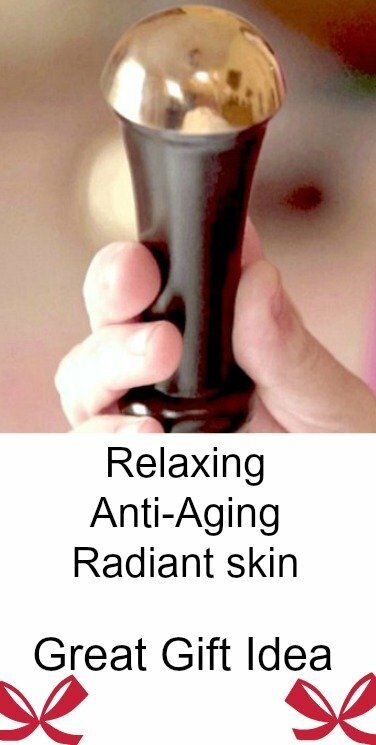 The best thing you can do is start early and don't wait until you see signs of aging - like I did! That's why it's important to start at soon as possible before certain stubborn wrinkles set in. 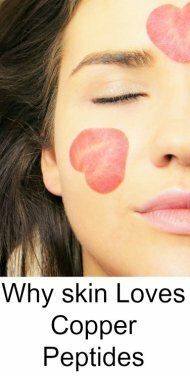 Because even after facial muscles firm up, the skin often takes longer to catch up. This is where facial massaging comes in. So, in addition to facial exercises, I'm also doing the suggested massages - especially the Neck Brush to address stubborn neck lines. To be honest, I didn't realize how essential facial massages are for successful results. Read: Why these simple Face Exercise Tips make a huge difference. And, in the meantime for those tiny lines under the eyes, I use the Easy Eye Solution Instant Eye Tuck. It helps hide them and lift the lower lids a bit. 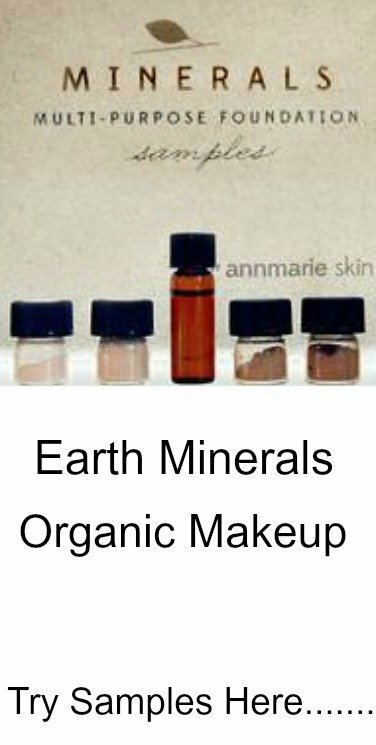 I think you can gain tremendous benefits from facial exercises as long as you select a program that actually builds (not just tones) muscle, massages the skin, and addresses facial bone loss issues. One reason our face ages with time is due facial bone loss. When our facial bones shrink and thin, the skin and muscle will tend to sag. You can read more anti-aging benefits of facial bone remodeling and see what your facial bones look like as you age here at this link. Afraid to try face tightening exercises? Facial exercising may be somewhat controversial... Some people believe they work and others are afraid to try them. Personally, I believe it's a matter of choosing an exercise program that's designed correctly so you don't wind up overbuilding certain areas of the face. And, of course it's important to choose a program that you'll enjoy doing on a consistent basis. Shop around on-line and preview the many different face exercise programs available. Many sites will offer a preview or sample exercises so you can see if this is something you feel comfortable doing. You can learn more about the program I chose here at this link.